A fancy bathroom that totally impresses with its scale, rich jewel tones, detail and luxury of materials. I love the detail in the cabinetry, bathroom window treatments and the wall finishes. I must say, those swags and drapes and frills are something else. I also like the different floor levels and the choice of the deep colored marble on the floor, tub surround and repeated in the vanity top. Yes, there is a lot of marble and hard surfaces, but because it has such a rich color, it somehow softens the overall effect. It may at first appear as a very masculine room because of the choice of color, but there are many feminine touches in the curved lines and decor that will work beautifully for the girls too. A nice detail is the faucet that delivers a cascading waterfall into the corner of the tub. Just as an aside - I cannot imagine that television set being compliant with building code and safety regulations though. Which brings me to the three elaborate pillars arranged around the bath tub. They don't support a structure and are purely ornamental. I can think of a myriad of better ornaments to choose from to decorate your bath surround with, than those painted concrete (by the look of it) mass-produced columns. 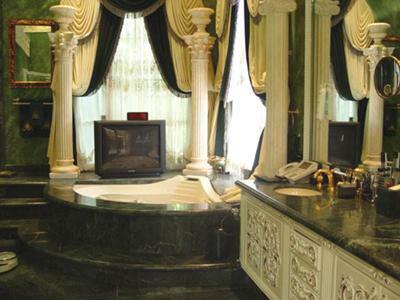 A sumptuous bathroom, none the less. This is indeed quite an ornate bathroom, but if it matches the decor of the rest of the house and the architecture it won't seem over the top. I do like the fact that there is some natural light but I wonder about the practicality of those window treatments. Or is privacy not an issue?